Play as Joemister on the quest to get to the last platform in this ACTION PACKED PLATFORMER. Try to make it to the end! Can you get the s e c r e t ending by going backwards once you get to the end? Post your times in the comments below! 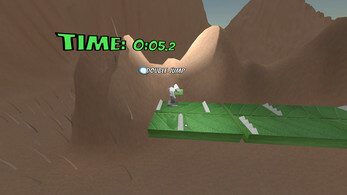 The game is about 3-5 minutes long, depending on how fast you can platform. Works in VR!! Best played seated. Alt + F4 to quit. Left Click - Yell at Joe to Jump. Yeah we spent more time trying to get stuff working in VR than we wanted. Bonus Points to Reiley and Calleb for helping us with the Inputs on VR, wouldn’t of been possible without you two! Also Ryan for telling helping us out for trying to move static physics objects. Unzip to a folder and run Joemister-LD43.exe then disco party dance to win.